Tired of being exposed to the elements while you're warming up for an event or, perhaps, to prying eyes when you're changing pre- or post-ride? The handy new Sqivvy has you covered -- literally. 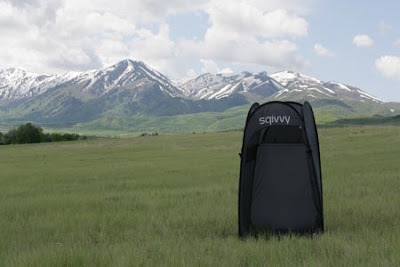 When folded down, the Sqivvy looks like a large folding car window shade and works in much the same fashion. It's about the size of a bicycle wheel compacted and "pops up" to 6' tall with a 4' x 4' base. It's great for a quick changing room when you're out and about or, better yet, makes the perfect shower area. Just rig up a solar shower and rinse the bike grime away! There's also room in there to set up your bike trainer, with the front wheel sticking out, in case of inclement weather before an event (cyclocross, anyone?). For really nasty days, the Sqivvy package includes stakes to keep it grounded. While many larger bike clubs roll up to events with an armada of trainers, EZ-UP tents, folding chairs, and, frankly, more amenities than I probably have in my house, I tend to travel light to most of my races, without the full support of a team. With the Sqivvy, you get much of the functionality that takes your competition lots of cargo space and many hands to set up -- and it's ready to go in a fraction of the time. I plan to add one to my race kit. Available for $89.95 via the Sqivvy website.